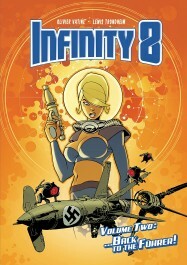 The city-sized, deep-space cruise ship "Infinity 8" stops halfway in route between the Milky Way and Andromeda, blocked by a massive field of debris containing wreckage and artifacts from countless planets, cultures, and possibly dimensions. The captain of the ship calls upon eight of the ship's top security to investigate the anomaly, each one sent out in a parallel time-loop to collect information which can then be assembled to hopefully discover the truth before disaster erupts. Each time-loop lasts only eight hours, at which point things snap back to the way they were when they started, with no memories of their time in that window. Can the eight agents solve the mystery without making things worse? Danger reveals itself within the interspecies population on the ship, some of whom may know more than they lead on . . . 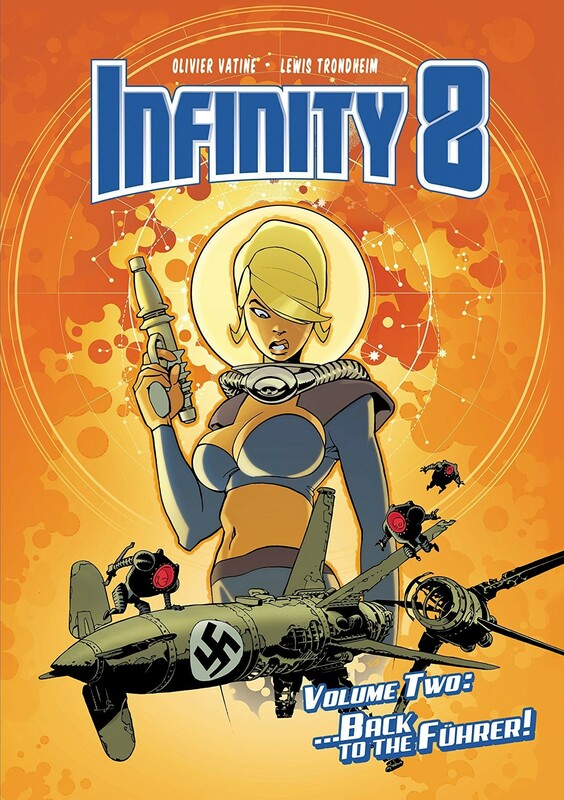 The second in the eight-volume series of pulpy sci-fi adventures, this time by legendary writer Lewis Trondheim and series designer Olivier Vatine themselves. Another venture into the field of debris uncovers some strange artifacts from numerous historical eras . . . including the head of Adolf Hitler! Returning it to the ship for study turns disastrous as their future science restores life and awareness to the head, giving rise to the threat of a brand new Reich made up of robots and fanatics who've lost all understanding of the genocidal agenda the former dictator originally unleashed! Crucial information transmitted by first agent Yoko Keren (at the end of Vol.1) has made the Captain decide to launch a new parallel time-loop and activate a second agent: the impulsive Stella Moonkicker, who will only have eight hours to collect the maximum amount of information possible. Flanked by Bobbie, her boring probation robot, shadowing her since her most recent bout of "unprofessional conduct," she is assigned as security for a group of fanatics who long for the return of the Nazis, not fully understanding exactly what the Nazis actual did or stood for. Their centuries-old impression has become watered down to something like a simple philosophy for peace . . . a far cry from the dangers of their actual original philosophy. But when they find the cryonized head of Adolf Hitler floating in the mysterious wreckage blocking the ship and try to reactivate it, the threat of a Fourth Reich on the Infinity 8 proves to be very serious. Stella and Bobbie will have to confront the reanimated Führer, who is confused by this strange future and hell-bent on taking over the world (again). But if the Captain is killed, no reboot can take place and the advent of the Fourth Reich will become the only time frame to have ever existed . . .